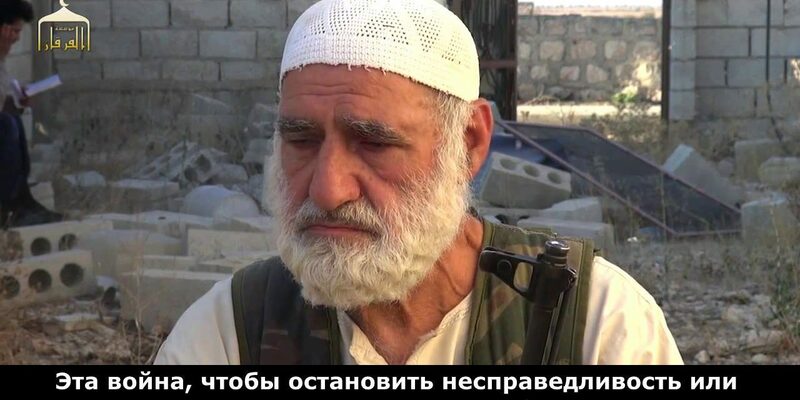 Russian-language pro-jihad website FiSyria, which focuses on Syria’s conflict, has posted a video interview with a man claiming to be a 75-year-old fighter with the Islamic State of Iraq and ash-Sham. The footage was shot before the final storming of the Menagh Airbase in Aleppo Province in August, an offensive in which ISIS cooperated with the Free Syrian Army and other groups. Abu Omar mentions Syrian President Bashar al-Assad once, as another target of the Mujahideen’s fight, but it is clear that his main preoccupation is with the more abstract concept of “unbelievers”, particularly those who control the Menagh Airbase. My name is Abu Omar. I’m 75 years old. I have 14 kids, 7 girls and 7 boys. Four of my kids are in the jihad. Plus one of my grandkids is a Mujahid. One of four sons has been in prison for 10 years, in an Iraqi prison. The Americans arrested him. He’s got another year and four months left before he gets out. Inshallah, he will carry on the jihad. My grandson is 20. He’s fighting alongside my sons. I was really cross. Why wasn’t I fighting alongside my sons? So I came to the jihad. Because jihad is fard al-ayn (an individual duty for Muslims). Inshallah, Allah will let me be a martyr on his path. And I will be a martyr, together with my children. I also desire martyrdom for them. And Allah will grant victory to Islam and to the Mujahideen, inshallah, against the infidels and godless ones and the fire-worshippers, and over the Taghut, and over Hezbollah, and over anyone who is the enemy of the Muslims. And also victory over Bashar. And everyone who is the enemy of the Mujahideen. Allah will give victory to all the Mujahideen. Allah will grant victory to them in Afghanistan and in Bosnia, and in Somalia, and in Mali, and in Iraq, and in Pakistan, and in every place where they proclaim the name of Allah. Allah is the witness of the Mujahideen and he will grant them victory. Allah helps them with his forces, his angels come down and fight with the Mujahideen against the unbelievers, just like they fought in the Battle of Badr. Allahu Akbar and Praise be to Allah! How do you feel when your children go out to battle? (Crying) I will dream and cry a lot, because I am not with them…. Jihad is a fard al-ayn for adults and for young ones, even for those kids who can just about lift a weapon. And for women. Jihad is a fard al-ayn, to fight against the unbelievers, and we will defeat them by Allah’s will. Why did you go out to fight against the infidels? I went out to fight against the infidels, like I already told you, because jihad is a fard al-ayn! Jihad is a fard al-ayn! I can carry a weapon, therefore I must fight and I must wage jihad, because I can carry a weapon. There’s no problem with my age. I’ve got the strength to fight! Is this war to end unfairness or is it to establish Sharia Law? This is a fight that will last til Judgement Day. It won’t end while there are infidels and believers. If we are victorious in this place, then we’ll carry on the path of establishing the Islamic State in every place. The Islamic State must arise everywhere, inshallah. Not just in Sham (Syria). If we are victorious here, then we will fight with other states. Inshallah. Which battle are you in right now? The battle of the infidels and the believers! I mean, where is the battle taking place? And Inshallah, we will defeat them. We will free that damned airbase, which is in the hands of the infidels. (Question from interviewer) What do you think about those youth who just sit around and don’t wage jihad? May Allah forgive them. May Allah forgive them. May Allah forgive them. May Allah set them straight, so they will join up with the Mujahideen. (Question from interviewer) May Allah forgive them. But when will they wake up? When the infidels break into their homes? When they destroy their women and children? I swear to Allah, I feel sorry for them. I’m sorry for them, because they don’t go out to join the Mujahideen, and they sit it out, like women or worse, in their homes. It’s fear, cowardice and even haram. They should join the Mujahideen and fight for the way of Allah! Anyway, the fact that they sit it out at home puts them in great danger. We’re scared that Allah will punish them. We ask Allah to spare them, and that they join up with the Mujahideen. And we ask Allah for victory in the Menagh Airbase. After that, we’re heading to Zahra and Nubbul (Shia villages). And we’re going to finish the unbelieving tyrants. I’m with the Islamic State of Iraq and ash-Sham. How do you Mujahideen feel about fasting during the month of Ramadan? Praise Allah, we will be blessed and have a great reward! But before the fighting we’re allowed to break our fast. When I am on the front and there is no fighting, then I fast. And we’re striving for that, right? The Prophet said, there will be a prophetic mission and then the righteous Caliphate. Afterward, there will be hereditary rule, then a government of tyrants, then the righteous Caliphate. And inshallah, clear signs of this have appeared, and inshallah, there will be a Caliphate in the way of Allah, in spite of the infidels and the unbelievers and all those who oppose the Islamic State, and there will be a Caliphate, inshallah. O youth! O young people! Why do you not join the Mujahideen? I have reached a ripe old age, you are young! It’s more effective for you to fight than I. Why don’t you join up? Why are you not affected by the insults that you get for not waging jihad? Allah, who is Great and Wise, will judge you on the Day of Judgement, because you sit it out, and because you don’t join the Mujahideen, and because you don’t fight the godless, the infidels and the polytheists. May Allah spare you! Join the Mujahideen to help them fight the unbelievers! Join them! I swear to God, I’m sorry for them….There is an atmosphere of faith. That’s what one of those who studied the Quran said. And he wasn’t one of the learned ones. Yes, yes. In 1980, they stuck me in the Tadmor Prison for two and a half years. But I didn’t feel like I was in prison. The opposite, I felt like I was in a garden. Why? Because I totally studied the Quran in that prison. And every day, I repeated at least five ajza (one of thirty parts of equal length into which the Quran is sometimes divided). I hope for help from Allah, and I hope that He will strengthen our pillars, and unite our ranks, and that he won’t plant greed in our hearts between us, and that he will make us into a single rank against the unbelievers and the godless. PreviousIran Forecast, Nov 21: A “Sustainable and Robust Deal” in Geneva Nuclear Talks?